Export a CSV file of contacts who have hard bounced or unsubscribed from your email subscription types. You can then remove these from your account. In the left sidebar, click the More tools dropdown menu and select Export unsubscribes and bounces. In the dialog box, confirm your email address. Select the Include global unsubscribes and bounces checkbox to include contacts who have permanently hard bounced for all HubSpot accounts. Please note: this exported file will include any email addresses that were previously deleted or imported in an opt-out list. You'll receive an email with a download link to the file containing the cumulative list of all current and previously deleted contacts who have bounced from or unsubscribed from email. The following columns will be included in the export, and your exported contacts will have a value of TRUE in any columns that apply. Portal Bounce: the contact hard bounced on a marketing email sent from your account. Portal Unsubscribe: the contact unsubscribed from all marketing emails sent from your account. Portal Spam Report: the contact marked a marketing email from your account as spam, or they moved the email from their inbox into their junk folder. Global Bounce: the contact has hard bounced for permanent reasons on marketing emails sent from three or more HubSpot accounts. Email subscription types: each of the email subscription types you've created in your HubSpot account, including the default Marketing Information email subscription type and any blog subscription emails. Please note: contacts who have not opted out of all email types (global) but have only opted out from Marketing Information or a custom email type are still eligible to receive other email types. Open the CSV file with Excel and use filters to remove recipient emails that contains FALSE for the headers Portal Bounce, Portal Unsubscribe and Global Bounce. The file should then only contain contacts that have bounced or opted out from all email types. 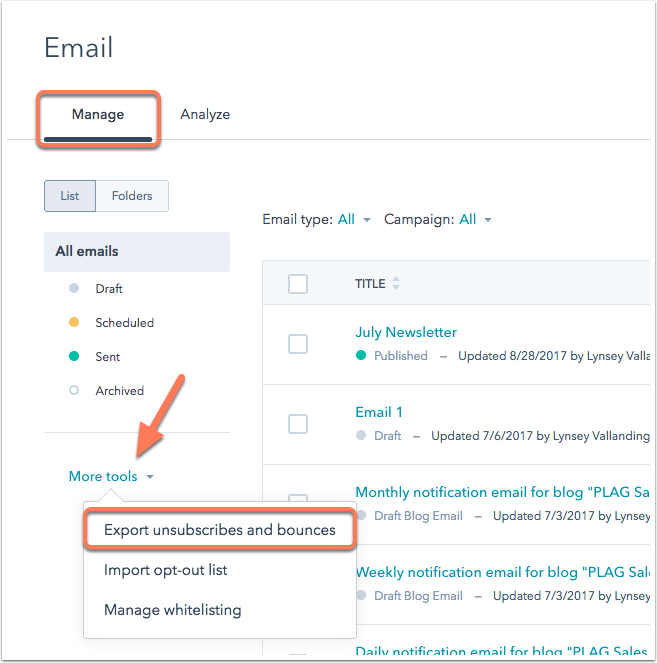 Please note: the HubSpot Community features a detailed tutorial about how to export your contacts and filter them in Excel to create your final list. This method is not supported by HubSpot Support. Import this file and create a new list of these imported contacts. In the list, check the box in the header row to select all of the contacts on the first page of your list. Click Select all x contacts to select all of the contacts in your list. Click the More dropdown menu, then select Delete.